Still Here - can you hand me my netti pot? So, aside from the injection of antibiotics, I got everything I wanted. When we discussed the inhaler, she said it would open my lungs a bit, to which I asked "do you think it would help me make it to the podium in Paris???" no such luck. Ah well. Many friends have openly offered their advice on sinus infection remedies - overwhelmingly endorsed the netti pot!!!! I went right out and bought my first netti pot tonight. I am going to capitalize this - THE NETTI POT IS MY NEW BEST FRIEND! I never thought that I would say that, but it's true. The feeling one gets by gently encouraging warm salt water to flow in one nostril and out the other is nearing euphoric - I know, the thought of anything coming out your nose sounds an awful lot like the laughing attack and Coca-Cola coming out, but this felt amazing. So, if it works, I am game...it feels good. Tonight, I added to my list of things to pack: Hot Beef Jerky, Smoked Paprika, and Ranch Dressing Powder packets. 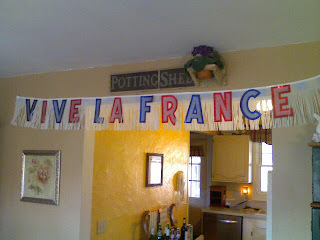 Add those to Jell-o, Peanut Butter, Jelly Belly Sports Beans, and my netti pot and you've got one hell of a party in Paris......Bring it on!!! Promise. We're just busy little bees getting ready for the BIG TRIP. We're also enjoying a little rest. I would argue that the last two weeks before the marathon are truly the best. You don't have the pressure of going so many miles, and when you do run, and do an old route that you used to consider IMPOSSIBLE, it's almost easy. That happened to me yesterday when I did my old 7-miler and made it up the entire hill (which, as you know, is over 700 steps straight up if you count 100 at a time and take a break in between like I usually used to do) without taking a single break. Running is refreshing and wonderful again. Maybe it just took 18 weeks to get in shape. We will keep you updated on our plans for Paris, and once there, try to find a cyber café so you don't miss a thing! Truth be told, I knew this run was out there, I've been wanting to do it for months, but the weather had to be perfect in order to truly enjoy it. Considering today was about 40 degrees when I left for my run and about 60 degrees when I returned...TODAY WAS THE DAY! Not only is today the LAST of the long runs before Paris, but it was an absolutely gorgeous day to run past the most beautiful scenery in LeRoy. . . check this out! This is Buttermilk Falls. Isn't it gorgeous??? 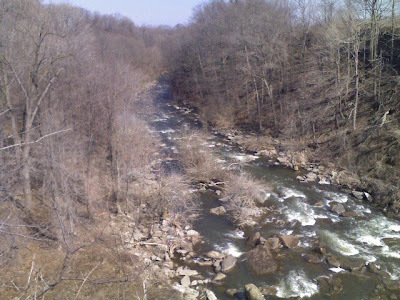 You would think I ran to Niagara falls, but NO, this is nearly in my backyard. (no guardrails, no signs, no tourist stops....just smack dab in the middle of nowhere.) You have to do a bit of tresspassing to get there, but everyone does it and no one seems to have ever been told to get off the property, so it tends to be favored hang-out of young couples and high-school kids. 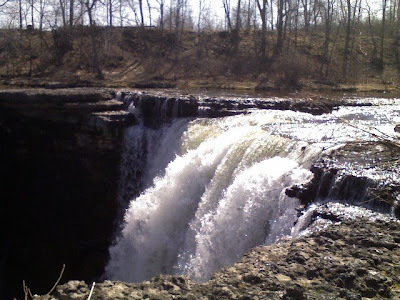 My friends and I spent a lot of time at Buttermilk Falls when we were young. 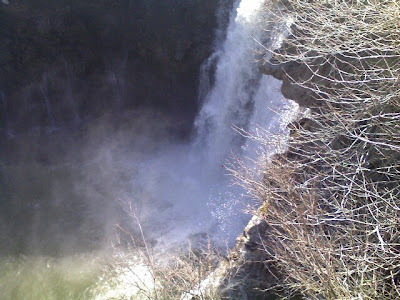 we would actually climb down the embankment and get right down next to the waterfall - always cold, but quite a rush. Today, I figured my luck would find me floating face-down in the whitewater....too much time invested in the marathon to risk it. So my nine miles were hard today. I am at the tail end of a chest cold that has left me tired and coughing a lot (mostly tired of coughting, but at this point, it's all the same.) I am hoping that it will be a thing of the past by monday and I can continue to reserve my energy for the trip across the pond. Maegon, our third runner, leaves tomorrow for Vienna. She will be meeting us in Paris on Friday night. It is nearly here! Thank you all for following our journey, it wouldn't have been nearly as much fun without you! I HAVE THE BEST RUNNING PARTNER IN THE WORLD! Just thought I would let you know! I mean, I've never actually run with her before, but I don't think that that is necessarily what being the BEST RUNNING PARTNER IN THE WORLD is really about. It's all the rest of it, let's face it! I'm just so lucky! Don't mean to get all sappy on you or anything, because we still have EIGHT DAYS to go, but sometimes when you're thinking these things, you just have to SAY THEM! Ce soir j'ai des amis qui viennent à Trieste de Florence (ce sont des amis de Falmouth, Cape Cod, mais ils sont en Italie pour étudier pendant 6 mois). Nous avons le rendez-vous à 8 heures. On va beaucoup manger et boire, je pense (j'espère!). 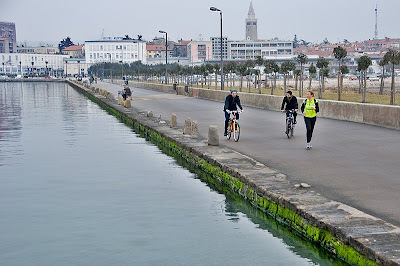 Demain nous allons visiter Trieste parce que c'est une ville très belle et intéressante! Dimanche nous allons à un mariage (mes amis Grazia et Igor s'épousent!). Oui, je dois courir aussi. Mais très peu parce que c'est une semaine de TAPER!!!! Qu'est-ce que vous faites ce weekend? "I'm totally excited. I'm totally freaking out. I'm totally excited. I'm totally freaking out. I hurt. I have butterflies. I'm totally excited. I'm totally freaking out. I'm totally excited. I'm totally freaking out. I hurt. I have butterflies. I'm totally excited. I'm totally freaking out. I'm totally excited. I'm totally freaking out. I hurt. I have butterflies. I'm totally excited. I'm totally excited. I'm totally freaking out. I'm totally excited. I'm totally freaking out. I hurt. I have butterflies. I'm totally excited. I'm totally excited. I'm totally freaking out. I'm totally excited. I'm totally freaking out. I hurt. I have butterflies. I'm totally excited. I'm totally excited. I'm totally freaking out. I'm totally excited. I'm totally freaking out. I hurt. I have butterflies. I'm totally excited. I'm totally excited. I'm totally freaking out. I'm totally excited. I'm totally freaking out. I hurt. I have butterflies. I'm totally excited." But mostly I'm just really excited. WE FEEL THE LOVE AGAIN! It's a good thing that we're tapering because I need the extra time to get all the preparations done. I keep forgetting that I need to get Easter ready for the kids, pick up last minute gifts for the folks who are hosting me in Belgium, upload the itineraries for everyone to the phone, run a bit, blog a bit...you get the idea. Can you think of anything that I am forgetting???? I think our readers are tapering too! Thank you for the well wishes you have been sending through Facebook, Daily Mile, email etc! We are getting really excited about next week. Can you believe the marathon is almost here? But for the rest of our Friends, it looks like you're reading (from 33 different countries last time I counted), but you're so quiet. Is everything okay? Give us a sign! We miss you. It's our last week of training. We're tapering, so we have more time for you. Sorry if we've been neglecting you lately. We'll try to be better. You might find this interesting if you're coming to Paris to run, cheer us on, or you plan on travelling abroad at some point in the future and want to know how to phone home or be phoned cheaply. Can you believe it? Me neither. But, I have to say, I thought it would be MUCH WARMER by now! Don't tell me we're going to have to wear coats over our cute Road to Paris running tanks! Let's hope that between now and April 5 it magically becomes Spring around here! Since week one of training. I know this because I am addicted to dailymile.com, which I signed up for yesterday. For you runners (and bikers and swimmers, etc) out there SIGN UP... and then add me as a friend. Because I only have two friends. I mean it! STAT! I'm using the Guest Book in the right margin to keep everyone up-to-date with what we're up to in Paris. Feel free to join us! This is Francesca, the gal I ran with on Sunday. Notice she's got her swag bag there. 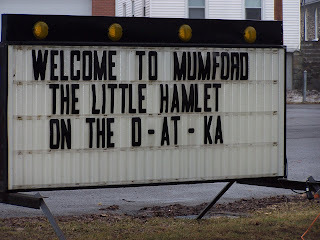 It was a little lame this year. While there was a bottle of wine (good), there was no salame or honey (unlike last year's EXCELLENT swag bag)... Attendence jumped to over 2000 participants this year, which I am sure is because word got around about all the good booty in last year's pack. One of the sponsors this year makes margarine. Yeah, so there was margarine in the bag, too. There were also a bunch of coupons-- in Slovene. Real handy. The post half marathon feast! I may have burned 1300 calories yesterday, but don't worry, I reloaded with at least 4,000! This was just the first course: For you Foodies out there, why YES, it IS a plate of homemade Potato Gnocchi with Wild Boar! Good guess! It was followed by a giant rare steak (mooo!) with a terrano wine sauce, and mashed potatoes (patate in tecia). Dessert? HELL YEAH! Crèpes (gotta get into French mode) with chocolate, and coffee. And, that liter of wine, well, "it makes blood" is what they say around here, which you need after a hard, but amazing run! Do you like my medal? It's made out of a piece of stone. Last year's was made out of terra cotta. This one has that Je ne sais quoi. I wore it all day yesterday. Today I have it in my pocket (for those who remember to ask how it went yesterday;) and tomorrow I'll just put it away already! Here is an actual BEHIND-THE-SCENES conversation between Road to Paris runners, Maegon, Laura, and Jewelz, and the friends who are meeting them in Paris for a series of wild events and organized debauchery. Let's listen in and hear what they have to say, shall we?! Okay - I am setting a plan in motion, here. Because we are all scattered around Paris, I am taking the bull by the horns and setting a meeting place for FRIDAY night. (I know some of you are not going to be there yet, but if you are, here's the deal. )1 - Kari and I are going to rendevous at my hotel directly from the airport on Friday (I bet it will be about 2pm). I think we will be arriving at roughly the same time. 2 - I think that we will make our way to the Marathon Expo to get registered and enjoy the swag bags - and other freebies.3 - I imagine that Kari will need to check in with her friend who is 'hosting' her and her husband. (in the 5th arrondissement)4 - shall we see if we can meet up at my hotel in the PURPLE BAR at, say, 7:00pm? I am anticipating that I am going to be absolutely EXHAUSTED at this point, but I'll need to eat and have a little drinkie!! Then - off to bed. All you folks on EURO time can tuck me into bed and head off for an evening of utter debauchery! (just keep it down, so I can enjoy my sleep. )THOUGHTS?As for saturday? I have to go back to the airport to fetch my husband, and I know that several of you will also be arriving that day. I'm envisioning a rendevouz at some landmark for a mid-afternoon meet-up. THOUGHTS? FORGOT - one other MUST SEE - Jewelz, Kari, and I have a rendevous with Atalanta on Monday. Can we sqeeze a quick stop at the LOUVRE? I'll bring the golden apples. OKAY - one more thought, and then I'm done. FREE ADMISSION TO THE LOUVRE on the first sunday of each month - that would be the 5th. Maybe a quick celebratory stop at the Louvre after our baths, rests, ...just a thought. 1. what is Atalanta?2. I think that I have decided to come, details to follow.3. What are the plans surrounding the marathon? Will you all be in a group at some point along the way to cheer our runners on, wait for them at the end? If it is ok, I would like to cheer you along at the part marked "time keeping 30" on the official marathon map, and then go to mass not far away at the episcopal cathedral (starts at 11am), then meet you all for the postmarathon festivities. What do you runners have as a goal for the marathon?4. Not to be a party pooper, but the Louvre is going to be PACKED on the only day that it is free in the month (it is the same way in Berlin). I dunno.5. Thank you, Laura, for having the foresight to start suggesting things! Very cool. I always remember you being organised. I think the most important thing is that we have several times where we can all casually 'hang out' in a low-key atmosphere to talk and catch up. That might be hard to organise, truth be told. But, I will do whatever I can to help. Feel free to delegate, Laura. Tell me what you need. :)6. Ok, now I'm excited. LIAR LIAR LIAR - Just chatted with Kari. We're going to set a meeting time on Saturday at 4pm at the SOUTH leg of the Eiffel Tower. That should catch all the saturday stragglers, right? OK - the liar liar liar was ME - (I said I wasn't going to throw anything else in the mix, but I lied) Josh - so true about the Louvre, so I think we will try that on Monday, if we can manage it. Let the low-key moments be on saturday night, we can meet at Eiffel and then find a place to hang. Some of us will need to save up our energy. It sounds like you have just identified a CHEERING SECTION spot for our followers, cause I don't think any thought has been given to that. We will probably finish in close to 5 hours.Glad you are joining us!!! Sing loud enough and we may hear you all at the Bois de Boulogne! I don't really know how long it is going to take 37,000 runners to start the marathon, so I can only guess what time we will hit the 30k marker. BUT, as for the evening festivities, I know that Kari and I (and probably Maegon)will be icing, resting immediately after the run. We'll probably be up for an night of crazy celebration after 6 or 7.
as it stands right now, I will probably upgrade my current cell to international capablities. The bad thing is that people call it from Europe will have to pay international calling, I think. THe good thing is that people call from the states will be able to get a hold of me. It is really six in one, half dozen in the other.See you at the south leg! 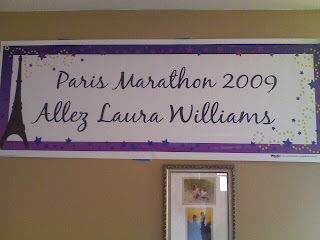 http://www1.hilton.com/en_US/hi/hotel/PARDTHI-Hilton-Arc-de-Triomphe-Paris-hotel/index.dothere's the link to my hotel....we'll be there waiting for you.Maegon - good luck on your long run....can't wait to see you there! champagne sounds like a great idea! At least one bottle for the finish line, right? Does Anyone Have Friends Like Mine? NON! NON! NON! I went out shopping for some clothes for my upcoming trip, came home feeling a bit under the weather, thought about bagging the weekly get-together-with-the-friends-for-Sunday-dinner, but decided I needed to eat - so I better go.... Here are some photos of the la petite soirée incroyable that I walked into. Merci à tous! (especially our followers KEB and Becky) I think you will all pick up on the theme of the party - - - sooooo much fun! Such great friends! 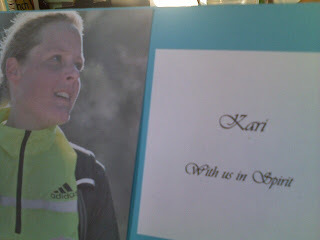 Kari - they even put a small centerpiece on the table with your photo and 'with us in spirit' message. They feel that they know you, can't wait for the day when they actually get a chance to meet you! Okay - so this isn't French, but it's BELGIAN, which is keeping with the theme. 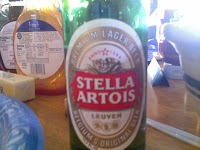 Truth be told, they tried to get their hands on some Jupiler, but alas, Stella would have to do. 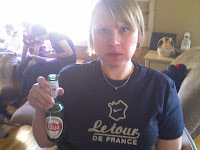 Becky wearing her Tour de France shirt for the occasion - nice shirt, Beck! Allez le Tour! There were so many other theme foods, but this is just a highlight of how awesome my friends are. They may not be riding their bikes with me for each and every mile, but they are there to toss oranges my way and throw a heck of a MARATHON party. We will do you proud! I have been wishing this stupid chest cold away, pretending that it didn't exist. While my little ones are hacking and gurgling away, I keep thinking healthy thoughts. 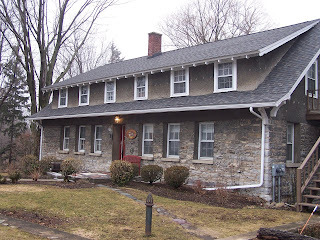 As my hubby went to help move my in-laws into their new house this morning, I found myself surrounded by germs, runny noses, boogers, hacking coughs, and what-not. I found it harder and harder to keep that chest cold at bay and at about noon, I gave in. Cough Cough Cough. Nap Nap Nap. Happy that the littlest one also fell asleep, I know I'd be safe to nod off for a little snooze. This came with a price, however, because I skipped lunch. This would have been okay if I didn't have to run 12 miles today. I had considered putting it off until tomorrow, but I have never cheated on my long run and I didn't want to start today. So, the energy that I acquired from my early morning bowl of Rice Crispies would have to make do. I put a pack of Jelly Belly Sports Beans into my utility belt, filled my water bottles, and headed out for my run. Not surprising, the energy wasn't there, but my pace was as predictable as ever - 9:33 the entire time. Today was the first time that I decided to stop and chat with a few people that I recognized along the route. I don't usually engage in such pleasantries while I am running, but my body needed those two breaks, and I felt better for it. In all honesty, if it weren't for those two small breaks, I think I would have found a way home at mile 9. So, while I didn't feel great, my pace was good (by my standards) and I didn't cheat. I may even feel a little bit better than when I started the run....Maybe! By the way, sometime between now and the marathon be sure to sign our guest book! It's down there on the right. Give us your encouragement, your running wisdom, your tired, your poor, your huddled masses yearning to be free... Whatever you want. We love that kind of stuff! What's on the Hibatchi for the weekend? Tonight I am going to stay home and rest my cold and load up on leafy green vegetables. I had a nice short taper run this morning, so that's that! Tomorrow I am going to take a day off of running, do some work, and have pizza with some friends tomorrow night (what's your favorite kind of pizza? I think I'll have a 4 formaggi!). 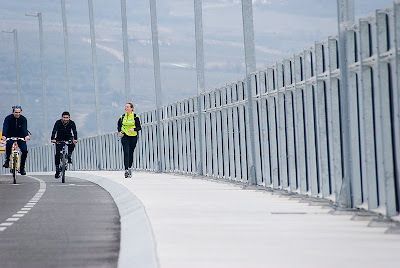 Then Sunday morning I will run the Sezana half marathon at a very slow pace, enjoy myself like crazy (please don't rain!) and thank the Goddess Atalanta for blessing me with her golden apples and bringing me this far in our training regimen, and then I will go out for lunch with Barbara and Marzio in Slovenia and PIG OUT! That's about it. I'm pretty excited about the weekend. It got cold here again, but the sun is out and that's hard to ignore! Bad moods and blogging simply don't mix, but bad moods and blogging partners make for some sesriously funny e-mails. As Kari, Ms. Fool, and Minken (and, of course, my husband and Bonster) are aware, I had an awful week at work. No need for details, of course, but it just happened along at the most inappropriate time. Don't people understand that when it is 20-mile week THERE IS NO TIME FOR ANY DRAMA?!? Well, I must simply say that if it weren't for Minken's advice on how to address my sore toes, I would never have considered purchasing my new pair of running "shoes." Minken - you are SOOOO right! All my toes needed in order to run happily was a bit more space in the toe-box. How are these going to look with my new running skort? Since purchasing these beauties, my running has really taken on a life of its own. Out I went tonight, and cranked out 9 miles. You should have seen the looks I got on my run today - I just don't know if it was because of the shoes or the red rubber nose! In any case, my feet feel better, my splits were amazing, and I am now laughing at the insane idea of actually running in these shoes (and the memory of my very horrible week is fading away....) Thanks guys! By the way, when I do those rotations (50 clockwise, 50 counterclockwise, remember?) under my desk I feel like that video they show on long flights about how to exercise in your tiny seat (with that big guy in front of you fully reclined and practically in your lap). But it works, so I'll keep it up. This is week one of TAPERING (a word that sounds like MUSIC after all these weeks...) before the big day. I signed up for a half marathon on Sunday in Slovenia (I couldn't resist. It's the one I told you about eons ago that serves you JOTA at the end, and gives you wine and sausage in the swag bag!). My plan is to take it slow and treat it as a long run. I did the same thing last year, as I was preparing for another half marathon a couple of weeks later. The route of this half marathon goes from Slovenia to Italy and back, a lot of it is terrain I covered during my first 20-miler with Marko, so it's familiar territory. I can't wait! I went for a short run with the dog this morning and I was ready to self-amputate under the knee after about three steps. The good news, though, is that there is relief for these pesky shin splints (if that's what they are, because I've only self-diagnosed). If I rotate each foot clock-wise 50 times and then counter-clockwise 50 times (it kills, though, let me tell you, because it stretches that long muscle running down the outside front of your leg, and who ever thinks of stretching that thing?! ), the pain goes away. The trick is to remember to do it. When I forget, I can count on about 20 minutes of torture, and then the pain just goes away. Since my run was about 17 minutes, it hurt the whole time, which was unpleasant. But today I've been rotating those feet like you wouldn't believe so that tonight's run, hopefully, will be pain free. I'll let you know. Also, I found a great resource for info on all kinds of problems you have when you run. JUST ASK THE ULTRAS! I mean, at 100 miles, everything you can imagine happening to you, does. And they're very forthcoming on everything: chafing, relieving oneself on the road, blisters, you name it, even shin splints. Plus, psychologically, when you read about these people running for like 30 hours straight, you start feeling like a marathon is no big deal. Also, when you think about their pace-- a good ultra marathon pace would be a 15-minute mile-- it makes your 10, 11, heck, even 12-minute mile feel FAST (as long as you don't take into account the difference in distance of about 73.8 miles...). I'm hooked! 33.6 Ks down! Paris, here we come!!! Hopefully this is my last time over this bridge for a while! 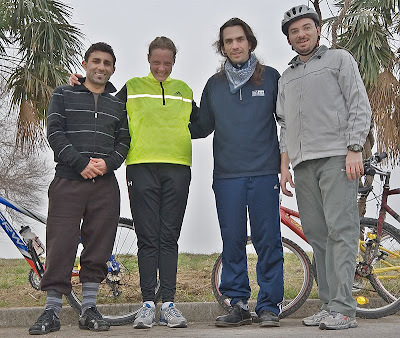 Special thanks to Marko and his bike for the great company yesterday, and to Davide and his bike for a great run on Saturday on the bike path!! Thank you for waiting so long to join me today on my 20 mile run. I am glad that you decided not to meet me at school, where I was joined by one of the girls who runs track for me and one girl (Jill) who was supposed to run the marathon with us. It would have made me look really bad in front of them had you chosen to tag along from the very beginning. I was glad to be without you when all three of us ran through our first watering/orange station (proudly manned by two other track runners.) The mood would have been very different had you been there. These girls made signs and were cheering away. They are usually the ones running and I am the one cheering, and I am sure that they have felt your presence before, but I am thankful you didn't show up there, either. We dropped one of our runners off, and that left Jill and I to run together for a while. It was great not having to work you, a third person, into our otherwise enjoyable conversation. I don't get to talk and run very often, and it was nice to enjoy those 9 miles without a glimmer of you! (despite your bad reputation, you were very thoughtful today.) Miles 9 - 15 were my time to shine, my time to run solo. It felt controlled and clear. My mind was in a good place and I enjoyed the sunshine as I ran. NOW - why you decided to show yourself at mile 16 is beyond me! I saw you from a distance and recognized the signs that you were creeping up on me. Didn't you have anything else to do with your day? Weren't there other people you could have pestered? I was almost done and no one would have known if you had just chosen to pass me by, without as much as a wink or a nod. BUT NO, I felt you throw your lactic acid my direction, I noticed the arrow of pain that you launched at my right calf, I recognized the weights on my legs as your masterful work. BUT HEAR THIS: the blood of Atalanta, goddess of running, runs through my veins and you can not and will not be stronger than that. So, Mr. Reaper, I am sorry that I left you in the dust at mile 18, I had just about enough of your poor pacing and nay-saying. I know what it is like to run alone, and you must have felt very helpless as I pulled away from you. You are such a downer and I really didn't want to have to listen to you anymore. Again, the blood of Atalanta is stronger than your will power, and although I spared your life today, be warned that the Atalanta power that Kari, Ms Fool, and I will bring to Paris should be enough to slay your sorry and slow arse. I don't know if you are aware but, the mighty Atalanta was known to slay the men who ran slower than her, and that should be just enough fair warning that you deserve. So, the next time you see us , we will be running in Paris strong and pain-free, just keep on going because you are no match for us and it will simply be a waste of your time. Let's Do This One Together! To Ms. Fool and Kari, YAY US!!!! This is the home stretch my femmes. As you said, "together we'll bang out 20 miles from our different locations, bound by the good vibes of our revered goddess Atalanta." For those of you who are just passing through our blog, here's the deal: Kari and I have become 'virtual' friends with a fellow blogger and marathon virgin, Ms. Fool. 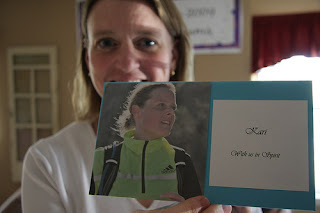 She will be running her first marathon EVER in Paris along with us. This chance "meeting" has made the past 6 months of training and blogging quite a treat and the shared training experiences from three very different locations has been something that keeps us going - even on the worst of days. (If you haven't checked our her blog, you really need to do so.) I don't know what I am looking more forward to, the 26.2 miles or being face-to-face with these two women. I'm telling you what, the photos of our trip are going to be amazing!!!!!! Tomorrow I'm going to run 10 miles (in theory) on the bike path with my friend David on bike. I think 10 miles is a little much for tomorrow, frankly (I've been dutifully following Hal's table this week, but my knees are burning already and I have to do that 20-miler on Sunday), so I'm going to play it by ear, which means I'm going to listen to the knees. I'll let you know on Monday what they decide. 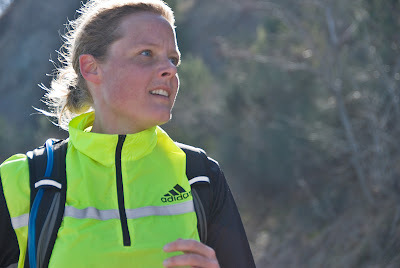 Then on Sunday I will go with Marko (you remember him, my navigator, paparazzo, running confidant, cheerleader) for the LAST 20-MILER BEFORE THE MARATHON. Which means that Laura and I will be doing the same distance for our long run this week! Too bad we can't run it together! I'm lucky to have patient friends with bikes, but Laura and I could certainly talk our way through a 20-miler no problem (we would have more than a mile for each year it's been since we've seen each other!). I'm worried that the marathon won't give us all the time we need to talk about everything. We have a couple of choices. We can run it extra slow (for me this won't be a big problem, I assure you), or make plans for a 100 mile ultra (but I think our families wouldn't approve). How many miles do you think it will take for us to truly catch up? And I'm not talking about my hair! They were entertained by the idea of buying and raising a pig for a fundraiser- I daresay we may see an Italian tradition in Caledonia! They all purchased buttons for a nice amount of money, over $200 from button sales. I am excited to add that to the total donation that will be going to the PolioPlus campaign! I was also very touched to be given a card stating that a book will be donated to my highschool library in my name - in the spirit of fostering literacy, a cause that, as a teacher, is also very close to my heart. For that, I am very thankful!! That is a great speaker gift! I am terribly excited to be invited back to finish the story of our journey to Paris that I only began telling them tonight. The conclusion, though I have a rough idea of what it will entail, is yet to be written. I am sure that there will be many great stories to share from our trip to Paris. If I could bother you for just one moment of your very busy day. 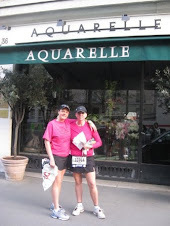 My name is Laura and I am training very hard to run my first marathon in the beautiful city of Paris. As a matter of fact, I ran TWICE today (3 miles at lunch and 6 miles after work) just because I am so excited to finish the marathon and I don't want to cheat on my miles this close to April 5th. I am sure that if you were to meet me and my friend, Kari, in Paris, you would share in our excitement. I am curious, have you ever run a marathon before? Our schedule is filling up fast, but if you would like to join us for our pasta dinner on April 4th, we might be able to squeeze in an extra chair. PS - do you think you could manage to get us a special tour of the Louvre, there are a few of us who need to bring some golden apples to Atalanta and we may need some special clearance to do so. Come on, help a girl out! Ok, this is after my 10-miler on Saturday. Notice anything OUT OF THE ORDINARY? p.s. I've been meaning to pick up that yellow Tupperware bowl there for about six months now. Note to self: NOW THAT IT'S LIKE SPRING, pick that thing up! This Should Help the Cause! My home district is SOOOOO on-board with our fundraising!!! Uphill Both Ways in the Fog! I am about 5 minutes from falling asleep, but I couldn't head to bed without giving the cliffnotes version of today's run. I usually do my long runs on Saturdays but we got about 2 inches or rain yesterday and I just couldn't find my snorkel, so I put off the run until today. The kids were driving both my husband and I nuts today, so I pushed one off on my mom (thanks Grandma.) Of course, they are angels for her! So, I re-routed my run from her house. 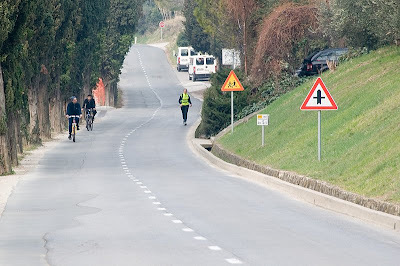 I couldn't decide whether I wanted to head downhill first and uphill toward the end, or go up the REALLY large hill toward the beginning and head downhill from there. Well, as I headed out, I quickly realized that it didn't matter what way I went first, the whole second half of my run was uphill, even though my first half seemed down hill. In other words, there were hills all over the friggin place and I wasn't going to avoid them no matter what way I went. I ran 14 miles in 2 hours and 10 minutes. I was pleased with my run and had a great time thinking about a lot of high-school friends along the way. I basically ran the route of my school bus and passed the time thinking about many memories with the people I went to school with. It was a nice run (foggy, but nice.) We are out of snow, now, so that basically means that my ice-baths are now COLD WATER baths. I feel the difference, now, but my knees and legs should be back to normal in the morning. I HOPE. I will post more later. Check out our day clicker - almost there! Next week is important because it is the last long, long, long run before the REALLY REALLY long, long long run in Paris (which is LESS THAN A MONTH AWAY). I'm looking forward to it. Today I understood what keeps us wackos running. OUT OF NOWHERE, after weeks of same same same, I weighed myself and there were 3.5 kilos missing. I was ready to run out the door and do an ULTRA right that minute! WOW! Laura said she had the same experience this week. For curious non-runners, the Paula Radcliffe waif physique clearly does not come along with just one marathon (DRATS!). We're going to have to keep going Laura... but where should we meet for our NEXT one? Can We Have A WOO HOO for Lima, New York? I just arrived back from my Rotary meeting with a nearby Rotary Club. The Lima Rotarians were few in numbers, but generous as if there were 100 of them! I enjoyed such great dinner conversation (and I'm not just saying that because it was mostly about Kari and I.) The singing was wonderful, by any Rotarian standard (and trust me when I say that I've heard a lot of singing Rotarians - these folks can sing!) The very nice gentleman across the table from me has just registered to run his first half-marathon (and believe me when I tell you that I was, and continue to be, somewhat tempted to register for the same half - early May???) and had lots of questions about our training and our progression from mere runners to MARATHON GODDESSES!! (ok, I may be putting words into this very nice man's mouth, sorry) I failed to go into the details of Atalanta and her abilities of a runner/slayer, but I trust that when he reads this, and he knows who he is, he may also find some time to pay homage to our Goddess Atalanta! So I was asked so many questions during dinner that I was left with very little new information for my actual speech, but I think that was ok. The best part, and Kari - you're going to love this, was when I pulled out the very last of the last shirts that I had from the Italian Rotarians. It went over like a charm - they agreed to grant it to the Rotarian who donated the greatest amount to PolioPlus (and the winner????? The nice gentleman who paid $76 for it.) If I can get more of these shirts (and I know there are some on the way) the Lima Rotarians have agreed to take another t-shirt to their meeting that they share with another club and offer that shirt to the Rotarian who donates the most to PolioPlus. (They vote for an extra large to bring the most bids.) I love Rotarians! 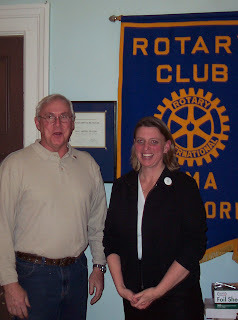 In the end, it looks as if the Rotary Club or Lima, New York is going to donate a total of $1,000 to our efforts. That's Service above Self and I'm proud of everyone who has helped us along the way. I have another meeting to go to next week with my sponsor club of Caledonia and I know it will result in another good post. 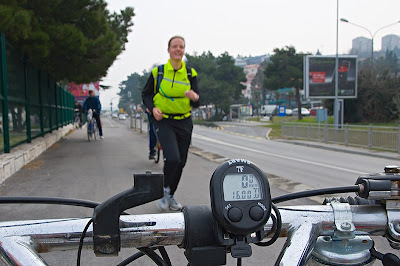 We started at the border between Trieste (Muggia) and Slovenia and ran/rode to Koper and almost to Isola (which would have added a couple of miles to the route, NO BIG DEAL, right? We'll try that NEXT time...). That's Nikolai on the left, Soran in the middle, and me on the right. This is where the run starts getting good, but it's almost time to turn back. Next time we'll start closer to here to take 100% advantage of the pleasantness of running on a boardwalk with lots of walking people. This is the view from Marko's bike at the half-way point (16k). My entourage including Marko on the right. What a great run! Thanks again, boys! This past week has marked quite a change in my training schedule. In agreeing to become the track coach at the school where I teach, I have effectively taken away the very established training time that I have worked so hard to maintain for the past 6 months. I know, I know, I know - the timing is far from perfect, but allow me to regain my place on the soapbox for a moment. In deciding to run this marathon, I was hoping to be a role model for some of my students. I suppose, in a round-about way, that would mean that if the school wanted me to coach track, I should at least consider it, right? Yup - so the moment that I agreed to do it, I think I regretted it (for purely selfish reasons). So, instead of closing up shop and heading to the fitness room with my workout partner, I am now boarding a bus with a handful of highschoolers and heading for the track. (whistle in one hand, stopwatch in the other.) Now, I can already tell that I am going to love it - really love it. I am already enjoying the chance to get to know the students, but I WANT MY RUNNING SCHEDULE BACK! Here are my possible solutions: (1) awake at 4:30 to hit the treadmill for my miles, (2) skip lunch and hit the treadmill for my miles, (3) stay up later than usually (8pm) to hit the treadmill for my miles. UGH!!! I'm trying option 1, but I can't stick to plan. I have been successful with option 2, but really miss my stuffed crust pizza and fiestada from the cafeteria (okay, maybe I don't), and I haven't considered option 3 yet because I have successfully fallen asleep by 7:30 for the past three nights (gosh, you'd think that option 1 should be easier considering the fact that I can't stay awake - hmmm.) Thankfully, Saturday practices are not looking to become a reality any time soon and I can continue to run the long ones on Saturday. AND - just so you know, I am using you all (and today's post) as a starting point for what will become my contribution to our friend Ms. Running Fool's blog, as she has asked me to be a guest contributor next week (TOPIC? TIME MANAGEMENT, of course) I have already joked with her that I blog from the bathroom and will write my column for her blog while ice-bathing following my long run on Saturday. SOOOOO - that will be something to watch for. (alright - I have to go work on my Rotary presentation) Please keep reading cause I'm finding a way to keep running - it's the least you can do! But instead of doing that, I got home at 6:20 and went to bed at 6:30 and woke up this morning at 7:30. I think I'm going to pencil in a good 13-hour nap EVERY Tuesday from now until the Marathon. I think you should, too! I realize that my ipod/nike connection to our blog is outdated. Well, the computer that I sync my ipod to has deecided not to work any longer. SO, I am afraid to sync it to my other computer for fear of losing my music. You just have to take my word for it that I'm running...cause I am. and I owe it all to my fans: Marko (navigator), Nikolai (who studied with us in Belgium who is American but lives in Strasbourg and will be in Paris with us, too, and is visiting me now) and Soran (Nik's Kurdish friend from Iraq who lives in Rome and was visiting for the weekend and left this morning). They followed me on bikes, cheered me on, gave me orange wedges, and encouraged me to eat a large breakfast before the run, which is reason number two for how well the run went: nutrition. I followed Minken's (free?!) advice about fueling up every five k's. I started at 10k with a pill (gatorade in pill form, if you will), then at 15 had a gel, then at 20 a pill, and so on, with a couple of dried apricots from Marko and lots of water (thank you, camelbak, old friend). I had two fuel-ups in the last 7 k's. At the end I even had enough in me to sprint to the finish. My watch says 3.24.52 which is more or less correct but I goofed up the chronometer at some point and had a potty break in there, too. I am happy with this result, since it's more or less the same time I had for my 18.7-miler a little over a month ago. Thanks again to Marko, Nik, and Soran. The weather report yesterday claimed that the digits wouldn't get into the 20's. I'll say it once, and then I promise I won't mention it again - THAT'S COLD! It made me think about the timing of this marathon. Training for a spring marathon in western New York means digging deep into the determination of one's soul. I have spent the large majority of my training on the treadmill - and mostly without too much hesitation but I just couldn't convince myself to go 18 miles on the treadmill, just to save my body from the sub-zero temperatures. So, as I waited and waited for the temperature to rise, I realised that I might be waiting for a very long time. I ask you, what does one wear when they are going to run 18 miles in sub-freezing temperatures? I put on an extra layer, but I was afraid to do much more than that because the last thing I wanted was to be at about mile 10 and realize that I needed to ditch the sweats and winter parka along the side of the road. All-in-all, I think I managed fairly well. I was thinking of our friend, Ms. Psychobabble Fool, as she ran her half- marathon in Central Park wearing her ninja mask. I was wishing for one of those facemasks! I knew it was cold when the water that drooled from the corner of my mouth froze on my jacket. 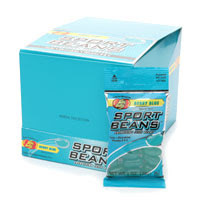 I am happy to announce that Jelly Belly Sports Beans rock my socks!!! I have been worried that my texture-induced nausea associated with consuming the very popular and widely used GU energy gels would put a massive damper on my ability to complete a marathon. Those of you who know me well are aware of my texture issue - I can't do bananas in their natural form because I can't stand the texture. So, I took some fellow marathoners' advice and picked up a collection of these wonder beans - not only do they taste great, but the tummy loves them. I noticed a huge difference in my energy level as I was out on my run. I recommend them to anyone and I'll bring plenty with me to Paris and will be more than happy to share my supply. I also took some advice from a friend in town who has trained for several marathons, and immediately drank Myoplex French Vanilla Drink to help increase my protein and begin recovering from the long run (thanks hubby for mixing in the banana and frozen strawberries.) I honestly can't tell the difference this may make in my training, but if it works from my friend, it's worth a try. Now, let's hope we get some hits on this blog - that error message a few days ago has put quite a damper on our hit counter..